HealthAid Hair-Vit - Strong, Thick & Shiny Hair is specially formulated to provide vital nutrients required for healthy looking hair. It is rich in B Vitamins and essential amino acids that may help nurture the texture, thickness and colour of your hair, leaving it feeling soft and healthy. This supplement may help nourish the hair follicles whilst thickening the hair and leaving it with a shining tone. People who are exposed to harsh pollutants. **Provides: glycerine, proline, hydroxyproline, glutamic acid, alanine, arginine, aspartic acid, serine, lysine, leucine, valine, threonine, phenylalanine, hydroxylysine, isoleucine, methionine, histidine, tyrosine. Free from: gluten, wheat, dairy, artificial colours, preservatives & flavourings. Adults & Children (16+ years): Take 1 capsule daily with breakfast. 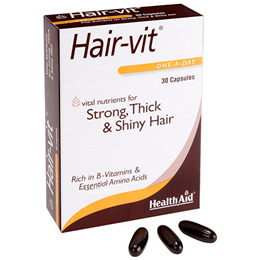 Below are reviews of HealthAid Hair-Vit - Strong & Shiny Hair - 30 Capsules by bodykind customers. If you have tried this product we'd love to hear what you think so please leave a review. I have only been using Hair-Vit for a few weeks but have noticed a change in my hair already. It feels stronger and does seem to be a little thicker. HealthAid Hair-Vit - Strong, Thick & Shiny Hair is formulated to provide vital nutrients required for healthy looking hair. It is rich in B Vitamins and essential amino acids that may help nurture the texture, thickness and colour of your hair.